Every year The Well’s Group hosts this event to educate the town on market trends and predictions for the coming year, on top of that the cocktail hour prior to the event is always a great time to see faces around town accompanied by drinks and heavy apps. 2018 Real Estate Market- What Happened? 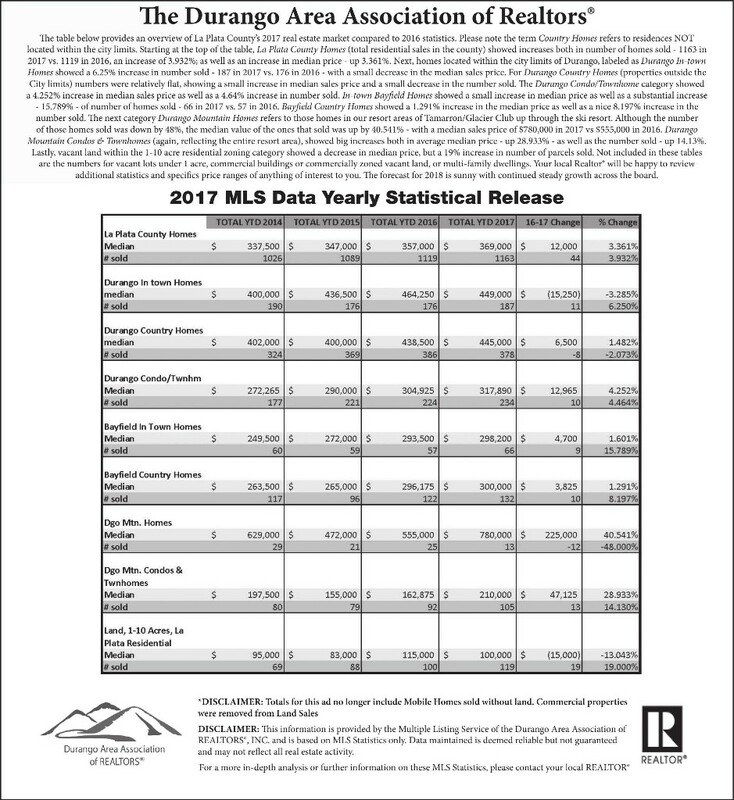 As noted by John Wells in the article in the Durango Herald the theme that we saw in 2018 is that the number of homes sold remained farily stable (slightly lower than the previous year), however the overall dollar volume was up, suggesting an increase in median price or possibly the result of more expensive inventory selling. For more information, and to view the statistics in full, please visit the Durango Area Association of Realtors website. The Wells Group also prepares year end data, which I share montly in my newlsetters. Below is a snapshot of 2018 in its entirety. If you are curious about the factors that effect the real estate market and what we can predict in 2019 and years to come, be on the lookout for an invitation to our annual Wells Group Forecast where we provide that information! As always, I would love to discuss the specific market sectors with my clients who are curious. So don't hesitate to give me a call if you have questions about how all of this information pertains to you. For those of you who like statistics and are curious about what the real estate market has in store, you shoukd definitely save the date for our Annual Real Estate Forecast. It's coming up on Wed, March 13th at the FLC concert hall. I have been a member of the committe that puts this event together for several years, and I am always impressed by how much data is presented and how many different aspects of our economy are covered. This information is vital to understanding the health of our community and it also helps people make real estate related decisions. A fabulous catered happy hour before the presentation, for our special clients and guests... that's you! It starts at 5 pm. A very well rounded presentation by local appraiser and researcher, Bob Allen. This includes information on all of the factors that affect our real estate market, such as tourism, tax revenue, the energy and construction industries and more. A recap of what the Wells Group predicted in 2018 and whether we were accurate with those predictions. John Wells' Top 10 predictions for 2019 and what that means to you if you are invested in the real estate market, or planning to buy. The presentation ends around 7pm. Hope to see you there! If you can't make the presentation, let me know and I can get you online access to the info later. Thinking of listing your home and want it to be ready to hit the market running? Here are a few tips as well as recommendations on who can help. Refresh Curb Appeal. We always want to put our best foot forward and that applies to your home as well. Even before a potential buyer comes to look at your home, odds are they have seen the listing on MLS or Zillow. Having the front of your home refreshed with trimmed trees and shrubs, tended flower beds, a fresh mowed lawn and a welcoming clean sweep makes all the difference. Make sure to weed and water throughout the time that your home is on the market. Paint Touchups Wear and tear throughout the home is natural and happens in every home. Yet it helps the home look well maintained when the paint it touched up from door dings, moving furniture etc. For Paint Touchups & Curb Appeal I Recommend: Random Tasks Inc. Deep Clean Whether you want to hire someone to deep clean or do it yourself, this is the best time to get the house deep cleaned throughout. Your listing will benefit from reviews of being clean as well as a fresh clean scent to boost enjoyment of the showing. Clean Windows Let the natural light pour into your home with spotless windows. Carpets and Floors Cleaned Clean floors can make a major difference not only in the feel of your home but can bring that older carpet back to life making it seem like a newer update that it may be. Un-personalize Your Home/Minimize the Impact of Your Pet Future homebuyers love to be able to put themselves into a home and envision what they will make it look like. Family photos are cherished memories so now may be a good time to wrap them up and box them in a safe box to make them move ready. Put away extra toys and beds, clean and hide litter boxes and make it look like they don't live there! Clean and Organize Closets Another important room/space in your home is closets. Think of the less is more approach when it comes to your closets to make them appear larger and cleaner. Declutter This is the number one way to make your home feel larger, empty space is good space. Have three containers ready with you: one for trash, one for donating, and one for items you’ll take with you to the new house but don’t immediately need. This way, half of the packing will already be done before you even sell your home. Stage the Home/Spruce Up the Pantry There is no need to go crazy here but homebuyers will be curious about the kitchen and the storage space that it holds, by tidying up this area you can increase the positive reaction people have with your kitchen. Consider Pre Inspection A pre-inspection provides sellers with a realistic assessment of the condition of their home prior to marketing it for sale. Sellers can then choose to make necessary repairs and provide proof of repairs to potential buyers. Over all makes the buyers more comfortable moving forward and helps to avoid extensive price negotiation later down the road. I thought it would be a good time to share some of my favorite indoor workout locations since we are dealing with some remnants of smoke in the mornings when it's cool and pretty high temps by mid day. I hope you enjoy! Yoga Durango: This studio offers a wide variety of yoga classes from Hatha, Yin, to Vinyasa Flow classes and many more. If you are in the mood for Hatha yoga my personal favorite instructor is Sheryl McGourty (she also teaches a wide variety of classes at the studio throughout the week if Hatha is not your cup of tea). My Friday nights are typically spent at my favorite way to unwind from the work week, Candlelight Vinyasa Flow at 5:30 on Fridays. There is no better way to prep for the weekend than to breathe and unwind in the candle lit room. I also really love Lindsay D's classes! The Sweaty Buddha: This is the place for those who like it hot. Although this may not seem like the best place in the summer they use a heating system that incorporates humidity into the air allowing for your dry skin and lungs to take a break. It feels SO nice!! Bif is one of my favorite teachers in this space. She offers powerful quick moving Vinyasa flows and a smile throughout class. Pilates Durango: I have recently starting going to this studio over the past year and have been enjoying their 7 am classes on the reformer and tower. The space is welcoming for people who are new to Pilates, with a range of classes from mat, reformer, tower and even Yamuna Body Rolling they have a class for everyone interested in Pilates. I tried my first jumpboard class yesterday and my calves are SORE! Axiom Cycling Studio: New to Durango, this studio opened in October, 2017 as a way to keep the Durango community in cycling shape throughout the winter and keep training active in the summer. My favorite instructor here also happens to be my assistant, Lexi. She is certified with the USA Cycling seal of approval which is a fancy way of saying she does in fact know how to train you to ride outside with your best health in mind. The beauty of the studio is that you can book your exact bike ahead of time online (which is a good idea since some classes sell out). Seriously, you guys, Lexi is everyone's favorite for great reason-- she has an amazing positive attitude and will make you work HARD! Her Friday afternoon class is an absolute must-try and you get a free beer after! The Vault: If you have been around Durango for a while you have more than likely heard of The Vault. They specialize in "Circuit X" a dynamic circuit training, which utilizes many muscle groups at the same time. The trainers and environment are extremely welcoming to all fitness levels. I haven't been to the Vault in a number of years but have a ton of friends who go regularly. They offer many classes throughout the day so you never have an excuse to miss class! Also, if the gym is your thing, I highly recommend Fitness Solutions. Don, the owner, keeps the place immaculate and it's open 24 hours. They have a great variety of equipment there. I've done group fitness classes there with Lisa Nielsen, who is amazing! She is a great trainer and her group class is awesome! You can also hire her for personal training as well. How lucky are we to have such amazing fitness options in our community?! Let me know what you guys end up trying... maybe I'll see you there! With the start of June also came the start of fire season. 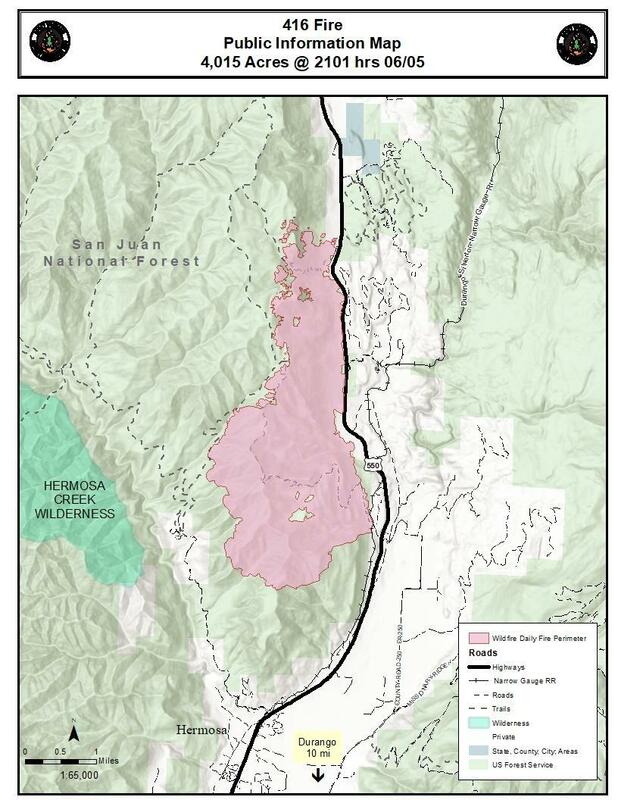 June 1st at 10:00 am, a fire north of Durango was reported. Since then it has been named the 416 Fire and has consumed 5,000 acres with 10% containment as of Thursday June 7th. The air quality throughout town has decreased due to the thick smoke that settles overnight, it is recommended to stay inside during these times and close the windows to your home to avoid over exposure. As of June 7th a Type I federal firefighting team will take over command of the fire, this team is called in for a variety of reasons such as size, need for additional resources and threat to structures. It's really tough to wake up every morning to desne smoke, thinking about the burning land, the animals, worried home owners, and the air quality. It's a reality about living in the west. Thanksfully we don't have earthquakes and hurricanes and other disasters. The GOOD news about this is that we were prepared with tankers and crews, we have amazing community support and to date we have not lost any structures. Also, as we've experienced in the past with the Missionary Ridge fire.... We Are Resilient! With a dry summer ahead of us with potential of more wildfires in the area here is what you need to know in order to prevent future fires: This is from the San Juan National Forest website. Beginning June 1, 2018, Stage 2 Fire Restrictions will be in effect on all National Forest System lands within the San Juan National Forest, including Wilderness. Fire restrictions are designed to protect people, property and the area's natural resources, and are in response to the exceptional drought rating in Southwest Colorado, increased fire activity throughout the area, and continuing hot dry weather forecasts. Building, maintaining, attending or using an OPEN FLAME, including fire, campfire, stove fire, charcoal grills and barbecues, coal and wood burning stoves, and devices (stoves, grills or lanterns) using liquid fuel such as white gas or kerosene. This prohibition applies to the entire San Juan National Forest, including Wilderness and developed camping and picnic grounds. Federal, state, and local officers and persons with a valid Forest Service permit or contract may be exempt from these prohibitions. May marks the start of summer and all of the activites that come with it for those that live in Durango. May seems to be centered around bikes and all time spent outside. Kicking off May events is the first farmers market of the year. If you are new to town or just want to start getting out and meeting new people or taking a walk with old friends the farmers market is a great way to spend a Saturday. The early season farmers market don't carry alot in the ways of fresh veggies and fruits but they are full of homemade goods, fresh coffee and pastries, and socialization under the sun. As far as bike events go May has some popular races amongst professionals and weekend warriors alike. May 12th features 12 Hours of Mesa Verde. It began as "Ride the Lightning" in 2003 but developed into its current 12-hour endurance race in 2007. Since its inception in 2003, the race has donated more than $350,000 to local organizations that focus on at-risk youth. Then comes the Iron Horse Bicycle Classic on Memorial Day weekend. Its a full weekend with a professional road race, a citizens road race, kids activies and a mountain bike race. Spring this year came with a nice surprise that was a few years in the making. 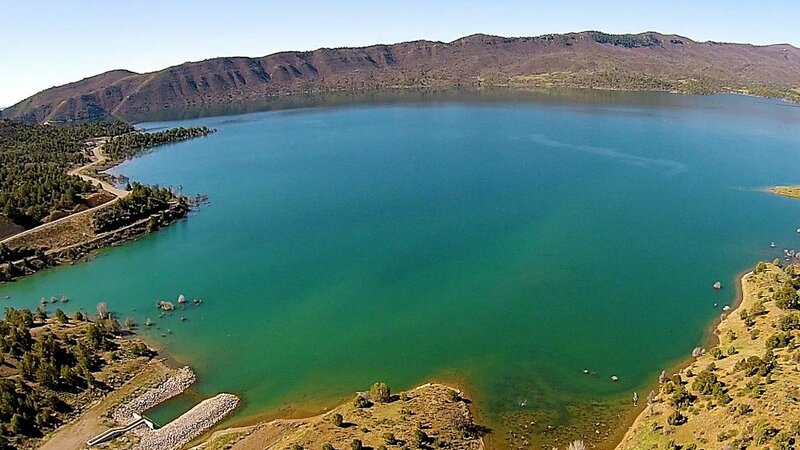 Lake Nighthorse (Southwest from downdown) became open to the public for the first time since 2003 when construction began to create the lake. Gas & electric motorboats will be allowed on the lake from May 15th-Nov 14th. Jet skis, houseboats or open-air-exhaust crafts are not allowed. Mondays and Wednesdays will be "quiet" days where no wakes are allowed. Aside from boating visitors can fish, picnic, and swim.There is no overnight camping or trail systems for hiking. The lake is currently open from 9 a.m. to 4 p.m. weekends from April 1- May 14th. From May 15th-November 14 the lake will be open every day. With the start of spring heading our way The Wells Group held their annual Forecast event on March 13th. This event is packed full of information about the Durango real estate market, both looking at trends from the previous year, as well as making predictions of what is coming in the future. Here is the link to the article that the Herald wrote about the event so you can learn a little more as well as the "Wells Talks" which include John Wells Top 10 topics as we enter 2018. Whether you are a buyer or looking to sell your home it is always a good idea to stay on top of your local market and this event tries to bring that information to the public. 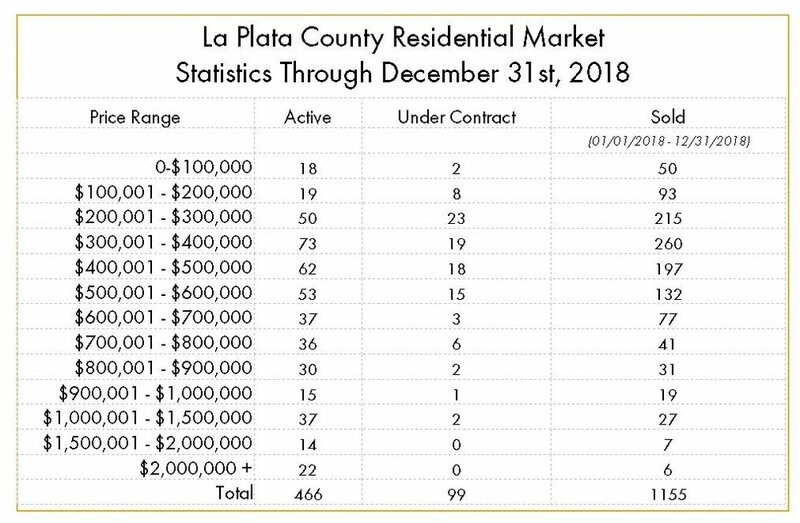 With 2017 coming to a close and us entering the first months of 2018, here is the summary of La Plata County's real estate market in 2017. These statistics compare the 2017 market to the market in 2016. The Durango Area Association of Realtors forecasts continued steady growth throughout the year of 2018. Another year, another Harvest Party. I am so thankful to have such incredible future and past clients that make a Sunday at Ska a time to come together, let the kids play, and drink a beer. Ska always puts on such a great venue with games for the kids, delicious food and fun atmosphere, in all honesty though it's the people that make it such a great day. For those who have never had the chance to make it I throw a Harvest Party every year for my clients as a way to say thank you and catch up. Supporting local business and bringing clients together helps me build the community of what makes Durango such a great place to live. This has been one of my favorite stuffing recipe's since I found it on Paleo Running Momma's blog! It is perfect for those guests that have dietary needs (Paleo, grain free, gluten free, dairy free, and Whole30 friendly), not only that but it is delicious. With full cook and prep time around an hour its easy to have going while you whip up everything else in the kitchen. 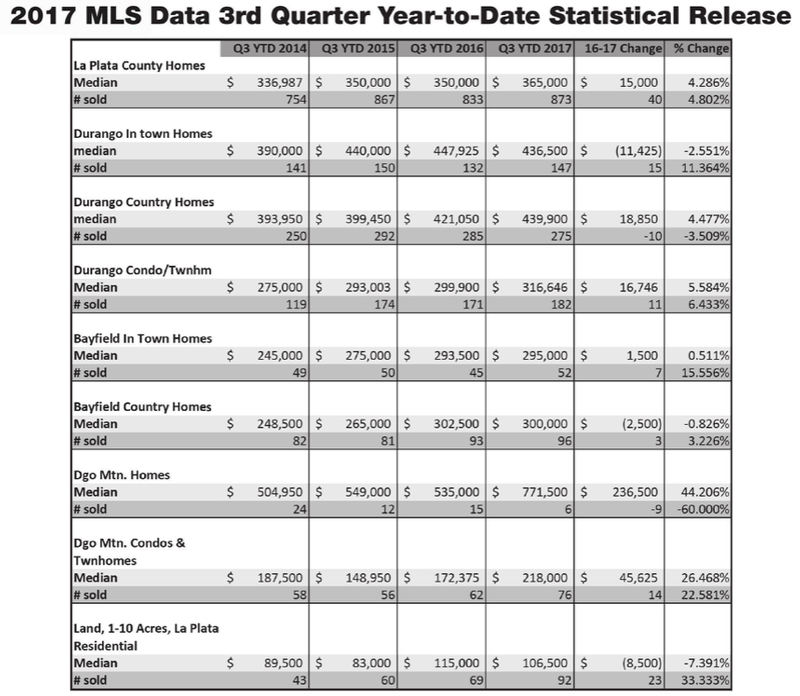 Looking at our County's real estate picture year-to-date through the third quarter, some interesting sales statistics present: 1. TOTAL number of real estate transactions grew 8.5%, as reflected by 1/1/2017-9/30/2017 total real estate transactions of 1166 compared to the 1075 real estate transactions 1/1/2016-9/30/2016. 2. Number of sold properties priced over $900,000 sold within these same nine months in 2016-a whopping 37% increase of sales in this price range. These figures encompass sales in all categories-residential, farm/ranch, commercial, vacant land and are not reflected in the table below.